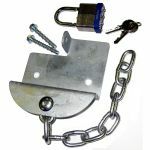 Also ideal for securing items in your garage, out-house, sports pavilion, etc. such as; flymo`s, ladders, etc. 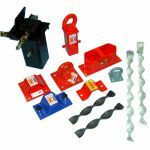 -Stock units offer a choice of 250mm, 500mm or 1 metre lengths, but we are able to offer bespoke lengths to order if you have a specific requirement. A practical and effective solution to theft or misuse of your wheelie bins! .....also provides a simple but effective way of securing items such as Flymo`s, ladders, etc.